Summer in Los Angeles is filled with lots of heat and lots of beautiful produce. The Copper Key Catering and Events uses this produce in our new offerings to bring vibrant color and flavor to your event. If you read our most recent blog, Experiential Marketing and the Entertainment Industry are Changing Events, then you know how important marrying every aspect of the event can be. That is one big reason why we choose to create new items for each season. It allows us to innovate, constantly pushing ourselves to create while at the same time having new items in our repertoire for those times when a client needs a wow factor for that next experience. We begin with a Summertime classic, the watermelon. Chef Guus Wickenhagen does his signature move of taking classic flavors with a modern twist and compresses the watermelon with fresh basil. He adds a tiny bit of feta cheese and reduced balsamic. The colors pop and we transform something that is traditionally sweet into a savory bite. Off to the sea for the next offerings with two new seafood experiences that are very different from each other. 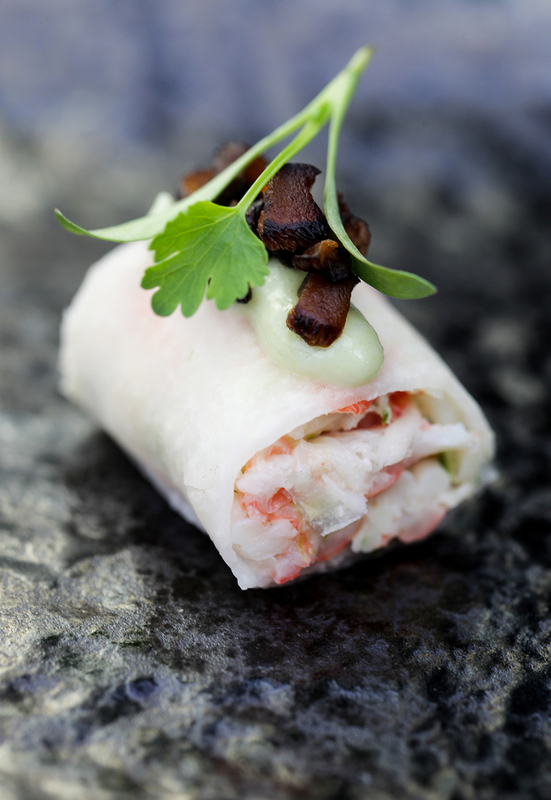 First up is the King Crab Cannelloni, wrapped in a thin slice of jicama for a fresh crunch which is inished with wasabi créme, lime zest, and the earthy contrast of roasted shiitake mushrooms. Next is a nod to our Chef’s Dutch roots with smoked eel. This pretty little bite features golden beet, apple, fennel, and lemon with the crunch of hazelnut. Both can work well for one event where it’s important to have pescetarian items that require one non-shellfish option. The flavor profiles and presentations are very diverse. The next two bites on offer are intended to transport your guests to different popular Summer vacation spots around the globe. Our Basil Ricotta Crostini with Honey Bacon is a nod to spending time on a yacht in the Mediterranean. The fig compote and pistachios finish off this bite with the taste of Sicily. A crisp Albariño wine from Spain would be a beautiful way to cut through the sweet fattiness of this bite and complete the fantasy. 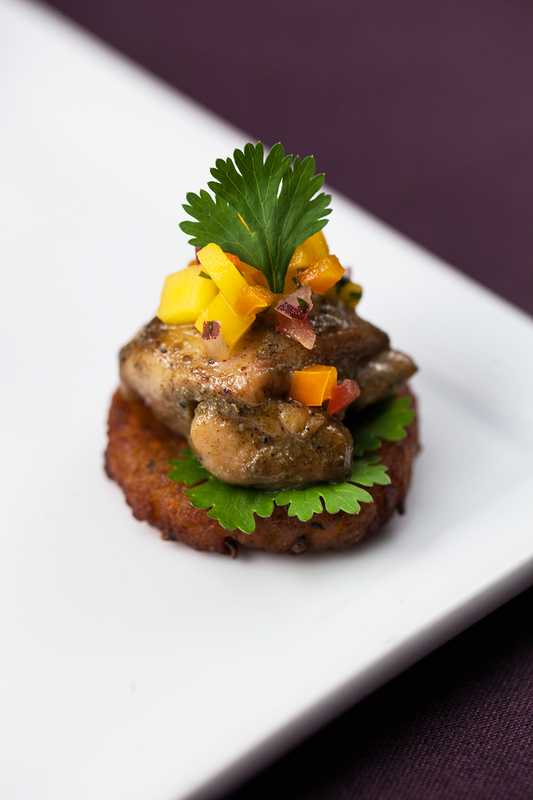 If spicy Caribbean flavors are what you’re looking for, we’ve got a new Jerk Chicken bite served over a plantain cake with a mango relish. Pair that with one of our craft cocktails made with Rhum en Blanc from the island of Martinique and you’ve got the beginnings of a pretty exciting beach party. The Copper Key Catering and Events is all about bringing Summertime to the table, not just to your cocktail party. Our grilled peach salad is the epitome of Summer with watercress and burrata cheese with crispy pancetta and rosemary lemon dressing that balances the sweetness of the caramelized peaches. The best accompaniment with this is definitely a chilled California sparkling wine like Schramsberg Brut Rosé. Our new entrée offerings span the Western part of the world with more classic flavors that celebrate some of the most prolific veggies in the Summer garden. Your seafood selection is pan roasted sea bass with Israeli cous cous, roasted bell pepper and zucchini, and tomato and garlic dressing. The oven roasted Jidori frenched chicken breast is served with a twist on the classic succotash and includes local corn, broccoli rabe, baby tomatoes, and basil lemon oil. This dish is reminiscent of American dinners that look like a million bucks but taste like it came from Mom’s kitchen, high-end comfort food. We’ve opted for a flat iron cut of steak this Summer as a lighter option. Chef Wickenhagen gives a light touch to mashed potatoes by adding arugula and pine nuts. This dish is completed with buttered asparagus and roasted chanterelle mushrooms. Our Summertime offerings are a vibrant selection of everything your favorite season has to offer. Bon Appetite! Mangia Bene! Eet Goed!